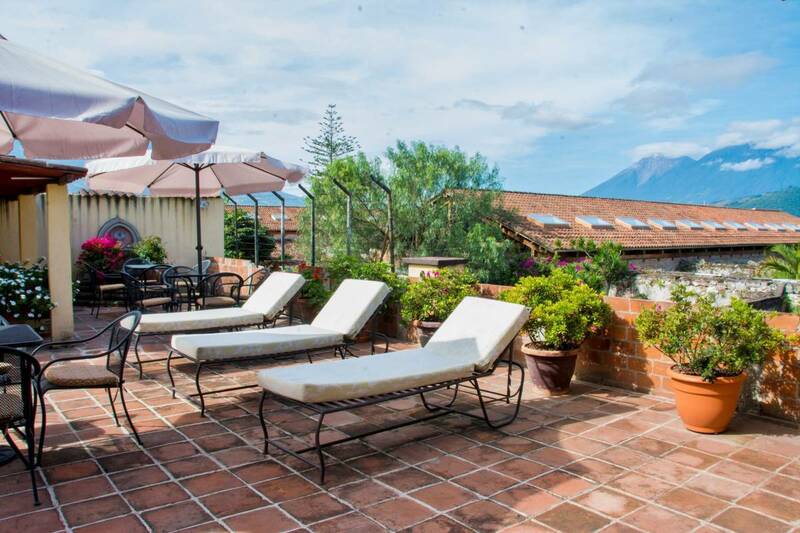 Hotel Las Camelias Inn is a beautiful budget hotel in the heart, of the majestic colonial city of Antigua Guatemala. We offer everything that you could need during your stay in Antigua. Our goal is to make your stay as comfortable as possible, whether you want to relax or you want to explore the city. Our great location, only 3 blocks from the central park, allows you to be close to all the important sites, and gives you a short, safe walk home every night. But, it is far enough away to give you a very peaceful rest. 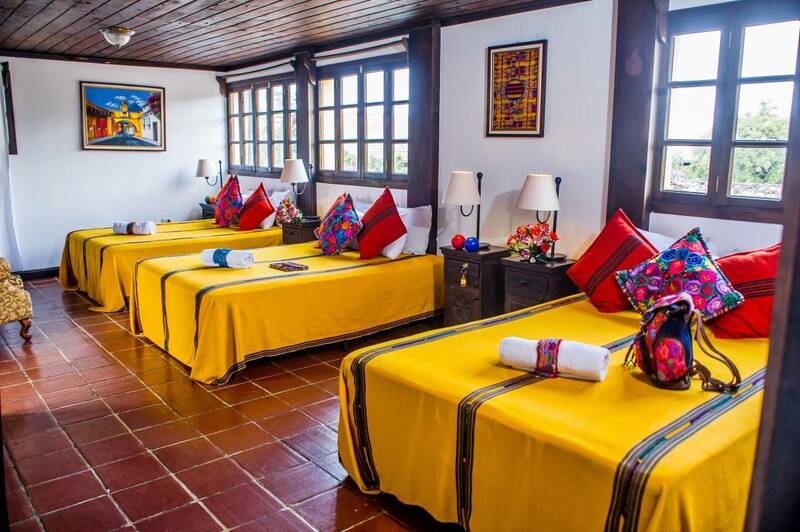 Our rooms and common areas are decorated with beautiful Guatemalan furniture and textiles. They are spacious with lots of light and bright colors. All rooms come with private bath, cable TV, hot water, linens, towels, soap and window views. They all have furniture for hanging and folding clothes. All rooms have many hand carved wood furniture pieces including beds, tables and lamps. We have a large 3rd level terrace with great 360’ views of the city, mountains and volcanoes. All rooms are well lit with ceiling lights and beautiful hand carved lamps on the night stands, beside all beds. There are many places to lounge around in our beautiful garden and corridors. It is easy to keep in touch, while you are here with our free Wi-Fi. We also offer a Travel Agency, laundry service, bag storage, Spanish classes, large terrace with sitting areas and a garden with a beautiful ornamental fountain. Our bi-lingual staff will help you with all your needs and give you good tourist info. For families with children, we provide pack-n-plays, high chair and a baby friendly environment. Hotel Las Camelias Inn is a very tranquil hotel in the heart of Antigua. In our properties group we offer 11 hotels and 2 sets of vacation rental apartments: Three 4-star hotels (1 with suites, 1 with a swimming pool and spa, and 1 set in the colonial ruins of a historical convent), two 3. 5-star hotels, three 3-star hotels, three 2. 5-star hotels. All of our hotels are within 4 blocks of each other and within 3 blocks of Antigua's beautiful central park. We have over 225 rooms and can accommodate up to 750 people. So, we can accommodate large groups in one single hotel or very large groups between a few of our hotels. Even if your group is split between a few of our hotels, you would never be more than a 3 minute walk from the rest of your group, since our hotels are very close to each other and very centrally located to the central park of Antigua. Also, if your group is interested in meal plans, we can provide breakfast, lunch and dinner. In Hotel Las Camelias Inn, we can offer single, double, triple or quad rooms with private bathrooms. We offer all private & comfortable rooms, 19 rooms in all. For your convenience the hotel offers private airport pickups for $37 (1-3 guests) & $8/extra person. For this service, we need your arrival time, flight #, airline name and from what city you are arriving. To arrange this service send us an email in advance at info@cameliasinnantigua. The hotel accepts US dollars, Quetzales, Travelers Checks and Credit Cards. If paying with credit card at the hotel, there is a surcharge. Our rooms and common areas are decorated with beautiful Guatemalan furniture and textiles. They are spacious with lots of light and bright colors. All rooms come with private bath, cable TV, hot water, linens, towels, soap and window views. They all have furniture for hanging and folding clothes. All rooms have many hand carved wood furniture pieces including beds, tables and lamps. All rooms are well lit with ceiling lights and beautiful hand carved lamps on the night stands, beside all beds. We offer single, double, triple or quad rooms, with private bath & cable TV. Our Quad rooms include 1 double bed & 2 single beds. Our triple rooms are either 1 double bed & 1 single bed or 3 beds. Our double rooms include either 1 double bed or 1 double bed & 1 single bed. If you reserved a double and want 2 separate beds, please send us an email to inform us of this. We have a large 3rd level terrace with great 360’ views of the city, mountains and volcanoes. There are many places to lounge around in our beautiful garden and corridors. It is easy to keep in touch, while you are here, with our free Wi-Fi. We also offer a Travel Agency, use of a shared kitchen, laundry service, bag storage, Spanish classes, large terrace with sitting areas and a garden with a beautiful ornamental fountain. Our bi-lingual staff will help you with all your needs and give you good tourist info. For families with children, we provide pack-n-plays, high chair a baby friendly environment. 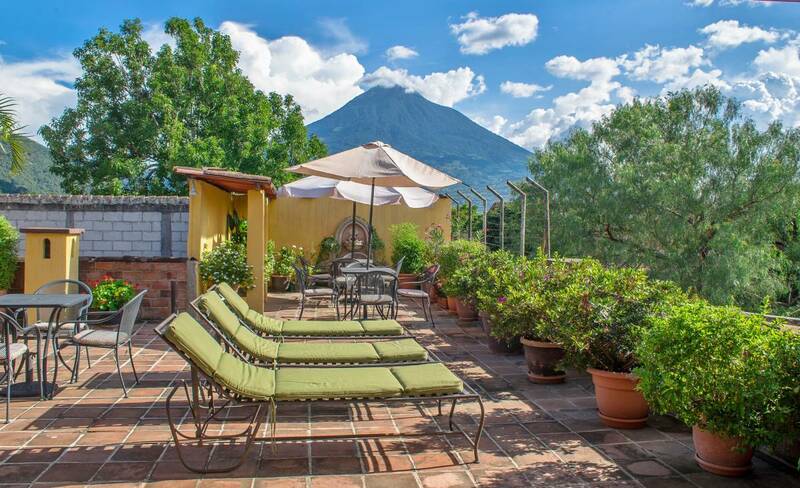 Hotel Las Camelias Inn is a beautiful place just outside the city center of Antigua Guatemala, only 3 blocks from the central park. This location keeps you close to all the important sites, but is far enough away for a peaceful rest. We offer everything that you could need during your stay in Antigua. There are many restaurants and shops within a 5 minute walk. 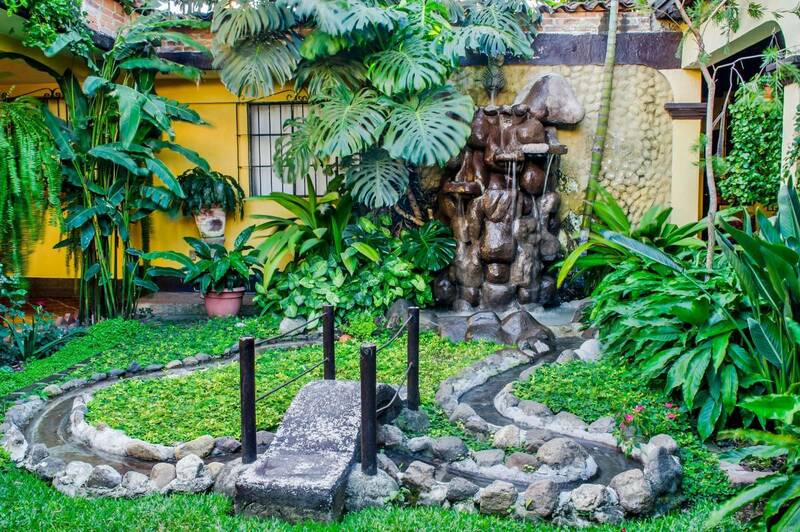 We are just a 2 minute walk from the famous Hotel Santo Domingo and the beautiful colonial ruins behind it. Also, there are many wedding and other activities at Santo Domingo, in which people are looking for close by hotels that are not the $200 plus dollars range. 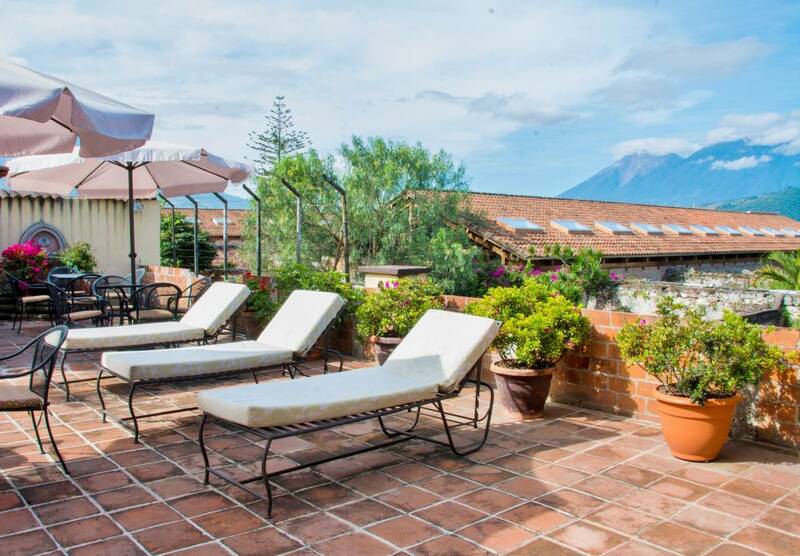 So, Hotel Las Camelias Inn is your midrange hotel in Antigua. If you are planning your own way, from Guatemala City airport, take a shuttle or drive to Antigua (45 minutes) via Calzada Roosevelt. Enter into Antigua, via 3rd Calle. Go 3 blocks straight down 3rd Calle and Hotel Las Calemias Inn is on your left at 3rd Calle Oriente #19. We offer private airport pickups for $37. This price is for 1 to 3 hotel guest. For larger groups, it is $8 extra per person. For this service, we need your arrival time, flight #, airline name and from what city you are arriving from. To arrange this, please write us an email at info@cameliasinnantigua.